Over the last few months, China has had several fairly nasty public rows with Secretary of State Hillary Clinton and Secretary of State Robert M. Gates, the two highest-ranking members of Barack Obama’s foreign policy team. And that raises an interesting question: Does China have any friends left at the top levels of the Obama administration? Is there anyone on the Obama team who will take a personal interest in dealing with China, as one or another senior official (Henry Kissinger, Zbigniew Brzezinski, the two George Bushes, Brent Scowcroft, Sandy Berger) did in the past? Or has China decided it no longer needs to worry about forging high-level personal relationships in Washington, a key element in its diplomacy since the Nixon opening? In his long career, Gates has had plenty of firsthand experience with America’s old, once-close relationship with China. In December, 1980, he was part of the delegation of U.S. intelligence officials, led by CIA Director Stansfield Turner, who made a highly secret trip to Beijing to forge a new, formal intelligence liaison relationship with the Chinese. Gates was an occasional participant over the next decade as the United States and China shared intelligence about the Soviet Union and carried out covert operations together in Afghanistan and Southeast Asia. Still, as Gates later acknowledged, this relationship was always a bit stilted, with a formal agenda and little spontaneity. On a subsequent visit from the CIA to Beijing, Gates tried to depart from the scheduled discussions by asking the Chinese about North Korea. As Gates later recalled in an interview, a hard-boiled Chinese military intelligence leader named Xu Xin said, “It’s time for dinner”—and he got up and walked out of the room. Skip ahead more than two decades, to this year. On Gates’s most recent visit to Asia, he made it clear that he hoped to visit Beijing, but Chinese officials wouldn’t extend an invitation. (Or to put it more precisely: They told Gates he could come, but said he could be hosted only by a lower-level Chinese official, not someone of Gates’s rank–a standard diplomatic snub.) When Gates attended an international defense meeting in Singapore, he ran up against a series of denunciations of American policy by Chinese military officials. In an earlier era, Clinton’s evident eagerness for a role in China policy might have set the stage for Beijing to court her as its principal interlocutor in the Obama administration. But things haven’t worked out that way. The revised, formal U.S. exchanges with China, now called the Strategic and Economic Dialogue, have become a bureaucratic monstrosity with more memos, participants and plane tickets—200 American officials went with Clinton and Geithner to Beijing in June— than significant results. At the most recent set of meetings, Clinton urged China to provide greater help in reining in Iran’s and North Korea’s nuclear programs, and made little or no headway. Meanwhile, during one of the sessions, a Chinese military official delivered a scathing attack on American policy. So while snubbing Gates, China isn’t doing Clinton any favors, either. And Clinton has clearly decided that after more than a year of conciliatory approaches to China, it’s time to push back. At a gathering of Asian leaders in Hanoi last month, she took China by surprise by rejecting, in public, its claims to sovereignty throughout the South China Sea. A senior Chinese official made clear he was infuriated. If China’s going to have icy, contentious relations with both Clinton and Gates, then where will it find a sympathetic ear at the very top of the Obama administration? The president himself? That approach seemed to work when the occupant of the Oval Office was George H.W. Bush. But Obama has far less in the way of personal history with China, a few other things going on, and so far, not much responsiveness from his own dealings with Beijing. National Security Adviser James Jones? His background is centered on dealing with Europe, not Asia; he’s involved in other issues like Pakistan. Geithner is the senior Obama official who comes closest to qualifying as an Old Friend of China. His father was a China hand at the Ford Foundation, and the younger Geithner studied Chinese and lived in Beijing while in college. But Geithner handles economic issues, not security issues–and on those economic issues, China has been taking Geithner to the cleaners. The assurances he keeps getting about a significant revaluation of China’s currency have turned out to be embarrassingly empty. For overall China policy, Geithner’s not going to be the main guy. It may well be that the old days when China cultivated warm ties with a senior official in each administration are now a thing of the past. Perhaps the differences in perspective are too great. As a symbol of the new climate, let’s look again at that Chinese official who responded so angrily to Hillary Clinton in Hanoi. It wasn’t some routine Chinese military official or Foreign Ministry diplomat. It was Yang Jiechi, the Chinese foreign minister, who has a long history in maintaining close personal ties at high levels in Washington. 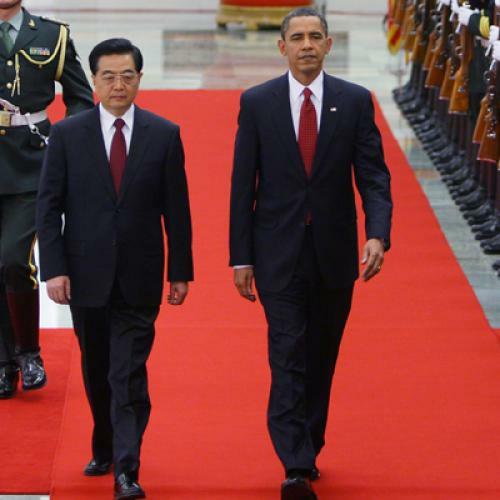 Yang began dealing with senior American leaders in 1977, when he was the young Chinese official escorting George H.W. Bush (who had just stepped down as CIA director), James Baker, and James Lilley on a visit to Tibet. Back then, they nicknamed him “Tiger” Yang, and he became a friend of the Bush family. After the Tiananmen Square crackdown of 1989, it was Yang Jiechi who was sent to Washington on a mission to try to smooth things over with the George H.W. Bush administration. And in 2001, after George W. Bush was elected president, China sent Yang Jiechi as its new ambassador to the United States, again seeking to deepen the personal ties with the top ranks of a new Bush administration. Now, at the top ranks of the Obama administration, these old friendships are gone, and China isn’t doing much to forge new ones.